Serving the entire San Fernando Valley and beyond, Dr. Michael Farzam is a board-certified internist providing the urgent care North Hollywood wants, by attending to virtually any medical ailment. 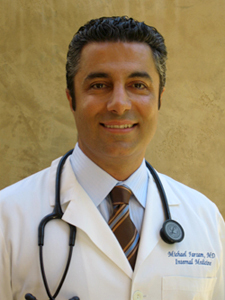 Dr. Farzam has been a house call doctor for the past decade, running House Call Doctor Los Angeles and attending to patients' medical needs, such as traumatic injuries, acute illnesses or flare ups of chronic diseases. No matter what a patient may need when they require urgent care in North Hollywood, Dr. Farzam can provide it, and he usually arrives on the scene in an hour or less. What's more, his appointments typically last 45 minutes, which is three times longer than the typically doctor would see a patient for urgent care. North Hollywood deserves more than run-of-the-mill healthcare, and that's why Dr. Farzam thought the idea of becoming a concierge physician was so attractive. By providing the kind of urgent care North Hollywood needs, Dr. Farzam is one of the few doctors that make house calls, but he is proud to give this service that patients need. Although patients still have access to a 24 hour doctor by going to the clinic or the hospital, a house call doctor can provide more personalized service that is never rushed or cursory. If you are in need of an urgent care doctor, call House Call Doctor Los Angeles today for a fee schedule or other information. Just call 310-849-7991 at any time of day, even weekends or holidays! Dr. Farzam is eager to get you back to health.